We’d not worried about the BTO’s GPS sandals (mostly because sandals aren’t really an option for census on Fair Isle), we’d wished that the story about Davie Gardener (a friend of many on the island and an extra on ‘Shetland’) was true and the long-staying Fair Isle plastic Magpie hadn’t made an appearance in the Obs garden, so the morning of the 1st of the month had largely passed without incident. However, I decided that I’d add my own element of foolery to the month by getting to the front door with my camera, deciding at the last minute to change boots and forgetting to pick my camera up again as I did. Sure enough, within half an hour, a Great Grey Shrike appeared on a fence post about 5 metres in front of me clutching a Meadow Pipit leg in its bill and generally posing as it realised it was perfectly safe from having its image rights infringed. The Shrike was later found in the Plantation on evening Trap Round, which still didn't quite make up for the mocking sight of my camera bag sat on the doorstep when I got back from census. The Shrike was the highlight of a pleasant fall of thrushes and allies, with counts of 152 Robin, 60 Dunnock, 50 Blackbirds, 26 Song Thrush, 9 Redwing, 4 Mistle Thrush and a Fieldfare. Other migrants making an appearance on 1st included the first Kestrel of the year, Jackdaw, 4 Black Redstart, 3 Grey Wagtail, 4 Greenfinch, and 3 Woodcock, whilst there were also two Red-throated Divers from the Good Shepherd, an Iceland Gull (also seen on 2nd) and the first cetacean sighting of the year, when a Porpoise was seen from the top of Lerness. 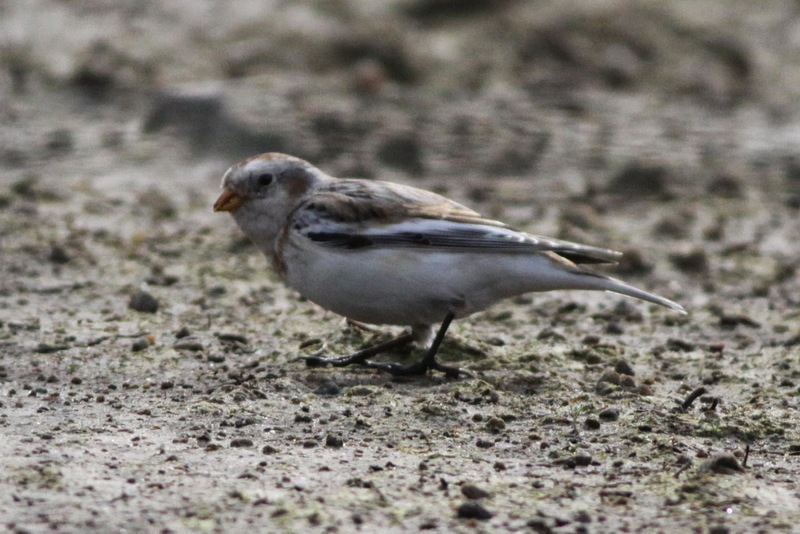 Small numbers of Snow Buntings are being seen daily and adding to a reasonable mix of species passing through Fair Isle at the moment. The 2nd saw a general decrease in most species, although Woodcock numbers rose to six (with four of these flushed from the trapping areas it would suggest there were probably more hiding out across the island), a Collared Dove and Water Rail were both probably new arrivals and there were increases in Woodpigeon (12), Brambling (14), Chaffinch (7) and Siskin (3), with 4 Black Redstart also still present. Several Brambling have been caught in recent days as they move north. 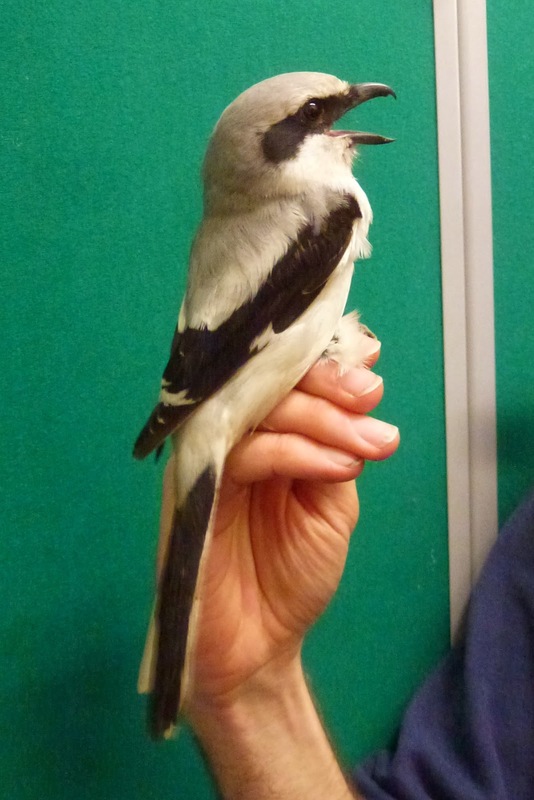 The strong early-May passage of 2012 saw a Belgian-ringed bird from January 2011 caught at the Obs, whilst individuals ringed at the Obs at that time moved to Helgoland in four days and Norway in five days, with another found wintering in Norfolk in early 2013 (photo Ciaran Hatsell). The main activity this morning though was a census of Tysties, with the east coast monitoring plot (the whole coast from North Light to South Light) producing a count of 196 birds in breeding plumage. This is the highest count since the 254 recorded in 1997, after which the population suddenly crashed, with a long, slow recovery taking place since then. It’s nice to get the seabird season off to a good start, although other auks seem slow to return to the cliffs (Guillemots) or even to return (Puffins). We also carried out the first Fair Isle Wren census of the season, with 23 singing males noted (although just under 40 sites have had singing birds so far this year). It’s too early to come up with a population figure, but it would seem that any worries about the winter’s weather affecting our endemic Troglodyte may be easing. As we were covering the whole coast anyway, we were also able to get a snapshot of Rock Pipits (75 were counted, with most of these probably breeding birds) and Eiders (119 were recorded). The Eider count is fairly low, although numbers often peak later in the spring, but as a direct result of the count, a male showing the mustard-coloured bill and prominent white sails of the borealis race was discovered off Skadan. Although this subspecies has been somewhat spoilt by the discovery that some ‘sailed’ birds have been raised in UK Eider colonies, this was still a smart individual. Finally, a piece of island news and we wish to extend our hearty congratulations to everyone at Fair Isle Primary, as entry into the Royal British Legion Scotland’s schools competition has won first prize , so the entire school will be heading off for a trip to London (including spending a night on HMS Belfast) in May – well done everyone, the whole island is very proud of your fantastic effort and the great piece of work you have produced.